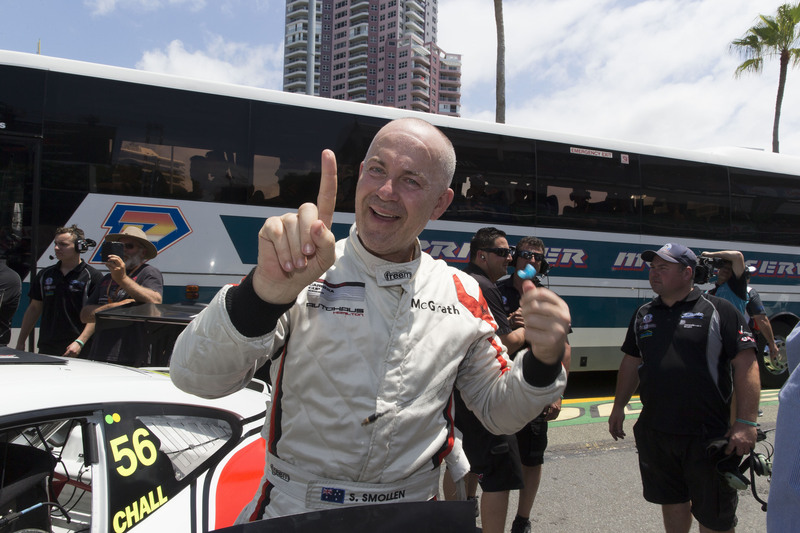 After extraordinary results for Shane Smollen and Matt Campbell at Bathurst, the MR team came to the final round of the 2015 Porsche Carrera Cup Championship cautiously confident. Our confidence was tempered however by the fact that we have never won this round or even a race on the tough streets of Surfers. Shane was leading the Tag Heuer Challenge Championship by 47 points so only needed a steady run to secure his first Carrera Cup crown. Matt had made his way up to fifth in the Pro Championship off the back of some extremely impressive weekends at Sandown and Bathurst but With Steve Richards and Craig Baird ahead it seemed an impossible task to finish the season in the top three. The team was excited and quietly confident heading into the final round of the Championship at Surfers Paradise. Matt qualified 3rd after being caught up in traffic on a few different pole-worthy laps. In the opening race he got a great start and overtook Nick Foster into turn 1 and he followed David Russell for 6 laps until getting by with a superbly forceful move into turn 11. He also recorded the fastest race lap of 1:13.01. In race 2 he got another great start and produced a faultless drive to finish first almost 3 seconds ahead of Russell. In race 3 Matt got another cracking start and led into turn 1. From there he didn't put a foot wrong and again won by over 3 seconds and picked up another fastest lap of 1:12.92. Matt Campbell blew some minds on his way from fifth to third in the final round of the 2015 Porsche Carrera Cup Championship! 1st, 4th, 4th and 1st in Porsche Tag Heuer Challenge Championship! After being the consistently fastest Tag Heuer Challenge driver in both practice sessions, we were surprised that Shane just missed pole after a one-lap flyer from Championship challenger Steven Grove. In race 1 there was a fair bit of madness off the start with some very aggressive manoeuvres from some of the other drivers. Shane settled into a good rhythm and chased Grove and Bates until mistakes by both drivers and a very smart drive in this crucial first race allowed Shane to finish first and put one hand on the trophy. In race 2 and after 'Championship Management' advice from Luffy, Shane drove a really smart race and let his competitors go ahead while he banked some valuable Championship points and finished in a solid 4th place. In the third race he did another great job to find a safe piece of track to stay out of trouble to again finish in 4th and secure third for the weekend and most importantly, his first Porsche Carrera Cup Championship! 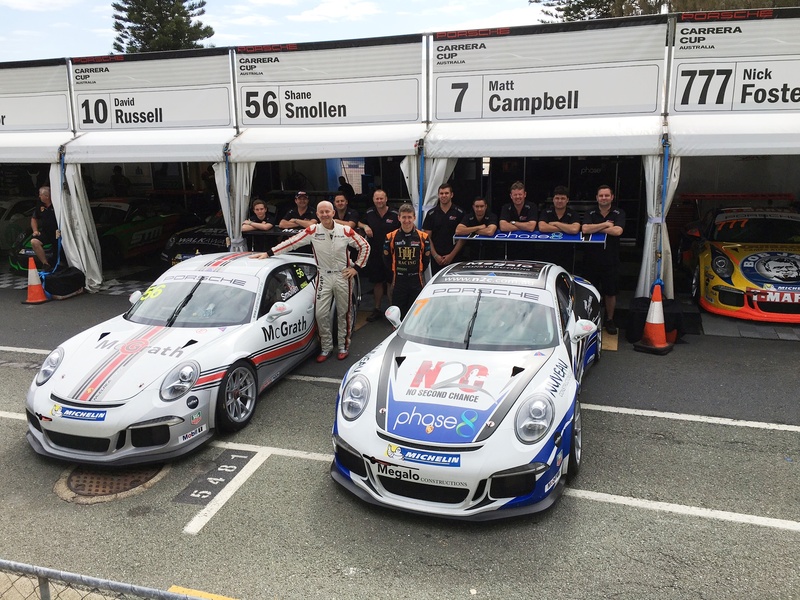 Well, that’s the 2015 Carrera Cup season done and dusted! 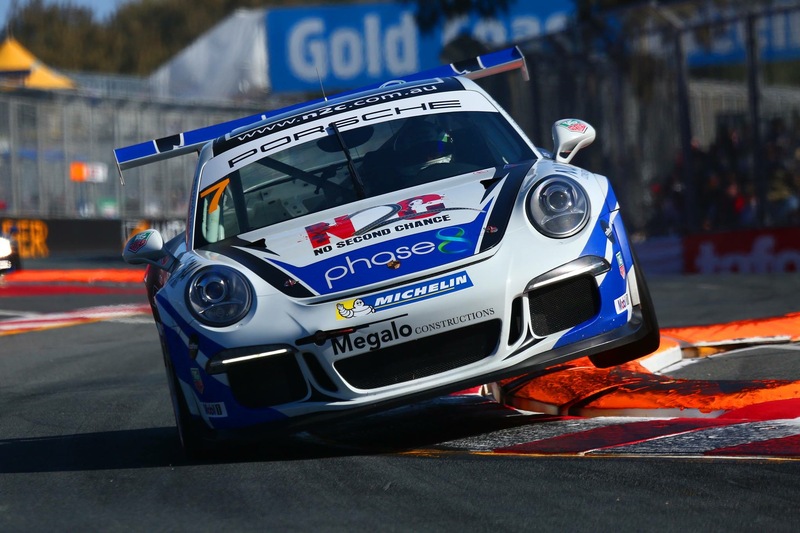 Firstly sincere congratulations to Shane Smollen on winning his first Porsche Carrera Cup title. He is a thoroughly deserving Champion and after some challenges early in the season, he put his head down and won many poles, races and rounds along the way. Special thanks to our resident works driver Warren Luff for all of his help with Shanes' campaign. We really hope to see Shane back in 2016. It is great to see the progress that Matt has made since Adelaide back in March, and for him to finish the 2015 season in the style, speed and consistency that he did, it will surely make for an exciting 2016. We went into this season with the goal of a few race wins and a round win in the second half and maybe a placed in the top 5 in the Championship but thanks to his form since Eastern Creek where he won his first race, he managed to overtake Richards and Baird in the last race at Surfers to finish an extraordinary 3rd in Pro Class. Thanks to Matt's valuable sponsors: Phase 8, Nuveau Constructions Qld, Megalo Constructions, Torus Networks and the Matthew Stanley Foundation. As well as Michael Hovey and Grant Sparks for helping establish the Matt Campbell Racing Equity Share Program with Matts' late-grandfather Bill, which kick-started Matt's professional racing career. 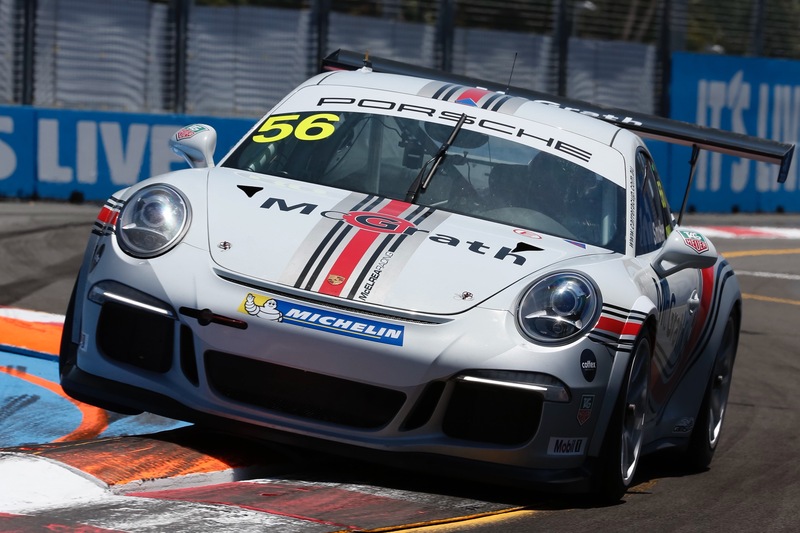 Looking back on the we season we would like to thank Spike Goddard who competed the first two rounds with us and Tony Walls who came back to the Carrera Cup in a rare one-off appearance at Bathurst. And finally, many thanks to the AWESOME MR Crew, their families and friends who allow them the time to do what we love as well as thanks to all the supporters of the MR movement. We have some other racing to round-out 2015 but we will be back racing the Porsche Carrera Cup at the 'Clipsal 500' in Adelaide in March 2016! 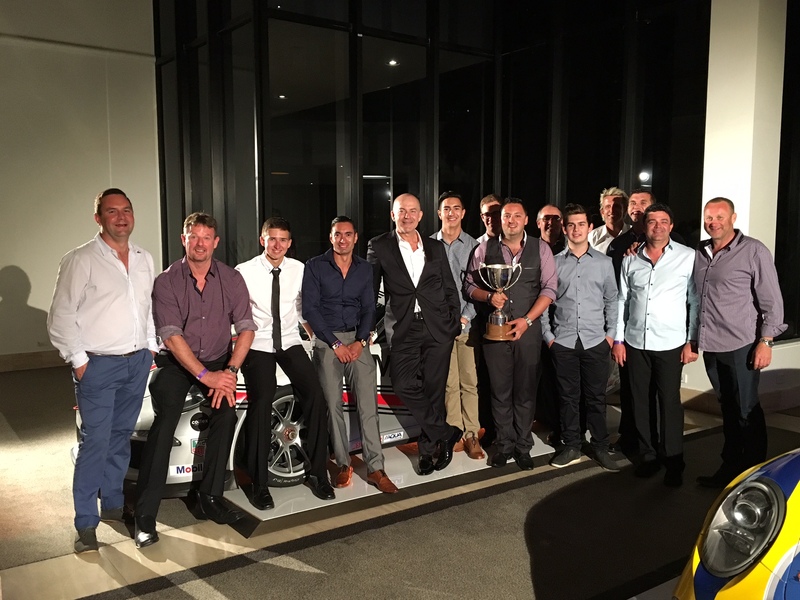 The Awesome MR Crew letting their hair down at the 2015 Porsche Carrera Cup Awards Dinner! !